The French town of Chamonix Mont-Blanc has been crowned winner of the title “Alpine Town of 2015”. This award endorses the development policy of the commune. Throughout the year as holder of this title, the “Capital of Alpinism” in the heart of the Alps will concentrate its actions on the climate and on culture. Chamonix, in the Haute-Savoie county of the Rhone-Alpes region, was crowned “Alpine Town 2015” by an international jury. The community of 9300 inhabitants in the shadow of Mont-Blanc (4810m), Europe’s highest peak, now becomes a member of the international association “Alpine Town of the Year” (see table). This chain of Alpine towns has come together to push for sustainable urban development in the Alps. The award is particular recognition for the policy Chamonix has adopted in relation to pro tection of nature and climate change. 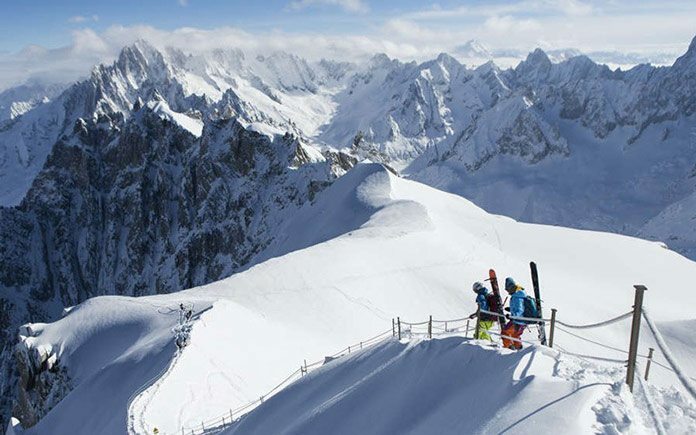 Chamonix-Mont-Blanc is the first French Alpine community to have put in place a Territorial Energy Climate Plan – a plan which aims to reduce CO2 emissions and energy consumpti on. Along with the “Alpine Town of the Year” Association and other affiliated towns, the commune notably supports the European “Mayors Convention” initiative which aims to reduce energy consumption by 20% and increase renewable energy by the same amount. In cooperation with the Swiss town of Martigny in the canton of Valais, Chamonix-Mont-Blanc has also put into place a planning and monitoring tool related to energy consumption (PlanETer). Mobility plays a major role in the Energy Climate Plan. The community is particularly active in the domain of transport: the introduction of the Carte d’hôte visitors card; free train and bus travel for all since 2005. With renovations to the train line from Le Fayet up to Vallorcine, two trains should be running in each direction by 2015. A parking policy and new layouts (nearby parking, different tariffs…) have also been introduced. The town has already had recognition for its transport policy with the award of the “Flocon vert” from the Mountain Riders organisation. Two and a half million holidaymakers visit Chamonix each year. Tourism is the principal economic activity of the valley. The commune has already launched a project dedicated to “ecotourism” which, throughout the year as “Alpine Town of the Year”, will continue to inform local inhabitants, tourism professionals and visitors alike of the need for a tourism which respects nature. A charter is currently in preparation which will allow all organised events to respond to the demands of sustainable development. Seven interactive routes allow visitors to discover the richness of the valley’s cultural and natural heritage by train or on foot (the ITINERIO app). In the long term, the town hopes to put conditions into place which will ensure a novice and sustainable economy, putting the accent on protecting the valley’s natural resources. Like other “Alpine Towns of the Year”, tourism and in particular mountaineering, make up the cultural heritage here in Chamonix. During its year as “Alpine Town of the Year”, Chamonix-Mont-Blanc will also celebrate the 150 years of the Golden Age of alpinism. In alliance with Zermatt and Grindelwald in Switzerland, and Valtournenche and Courmayeur in Italy, the town will organise a series of cultural events to pay homage to the pioneers of alpinism and highlight the relation between man and the mountains. Since 1997, an international jury has designated the title of “Alpine Town of the Year” to towns who engage in the process of sustainable policies in line with the Alpine Convention. These “Alpine Towns of the Year”, all share the same joint initiatives and united to form the association. At the present time, the association is made up of 15 towns from Slovenia, Italy, Germany, Austria, France and Switzerland. Chamonix-Mont-Blanc (2015) is the fourth French “Alpine Town of the Year” after Gap (2002, Chambery (2006) and Annecy (2012). The town is also an information centre for the Alpine Convention.